Rhino Fund – Girls on a Mission! 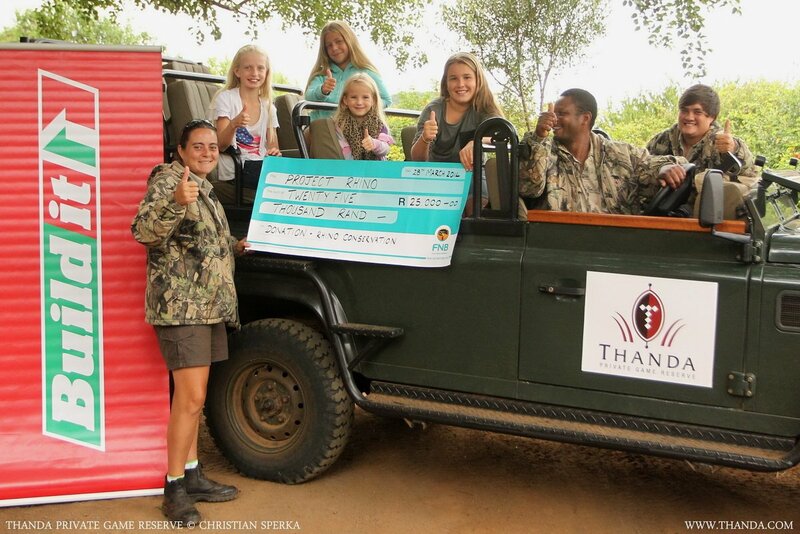 Thanda Private Game Reserve would like to say a huge thank you to four inspiring young girls who today handed over a cheque for R25,000 to the Thanda/KZN Project Rhino fund. The 4 girls (Jessica Johnson, Olivia Johnson, Kirsten Johnson & Kiara D’Offay) started their “Girls on a Mission Rhino Fund” when they received money singing to fellow campers on a holiday camping trip last year. They dedicated the money to help save rhinos from poachers, a cause they all felt strongly about and eager to do whatever they could to help. Over the course of the year they continued their fundraising efforts through a variety of activities including hand, foot and head massages, car washing, raffle prizes and selling produce grown on their farms at market days. They even donated their tooth-fairy money to their rhino campaign – demonstrating quite how passionate and committed they are for the cause! Inspired by their enthusiasm, the girls went on to attract support from Build It, who on a golfing tour helped to raise further funds through an auction prize supported by our very own Thanda Safari Lodge. Their great accomplishment has gone on to inspire the involvement of friends as well as their school, Grantleigh, who has offered to actively support them too on an on-going basis. Sadly Olivia was not able to join the trip to Thanda today however Kirsten, Kiara and Jessica were accompanied their friend and rookie supporter Robyn. Together they enjoyed game drives across the reserve and to identify and monitor the magnificent rhino. Accompanied by Mariana Venter, Jabulani Hlophe and Letishia Kleinschmidt from Thanda Wildlife Management Team they learnt just how significant their funds are and the specialist equipment it will help purchase to protect the rhino’s security and ultimately save them from poachers. In the picture from left to right: Mariana, Kristen, Jessica, Robyn, Kiara, Jabulani and Letishia. This is an AWESONE article. WAY TO GO GIRLS!! The girls are a great inspiration!